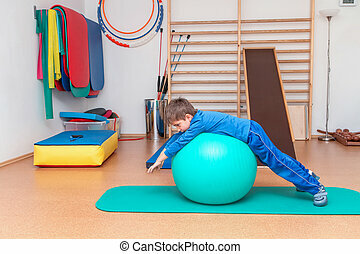 Physical therapy with yoga ball. 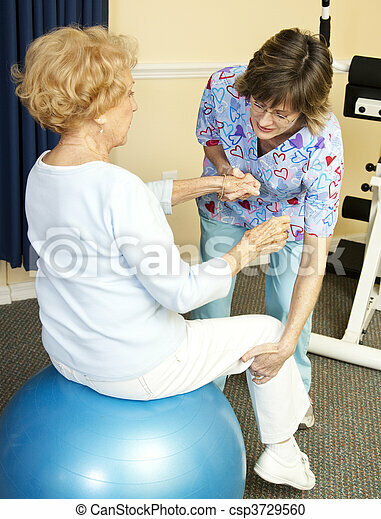 Senior woman on yoga ball, working with a physical therapist. 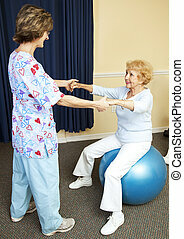 Senior woman on yoga ball, working with a physical therapist. 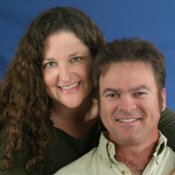 Boy and girl in the gym. 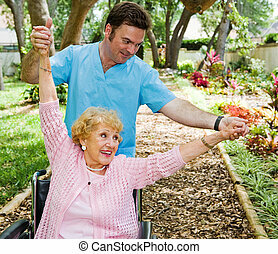 Beautiful disabled senior woman receiving physical therapy in an outdoor setting. 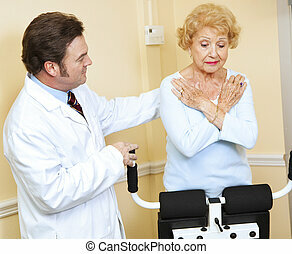 Senior woman with arthritis in her shoulder receives physical therapy in outdoor setting. 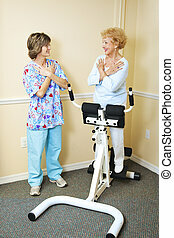 Senior woman enjoys working out with physical therapist. 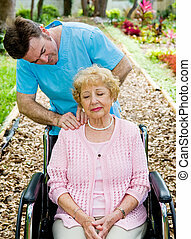 Senior woman in wheelchair receives massage therapy from a physical therapist. 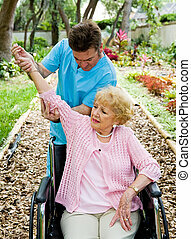 Physical therapist helping a disabled senior woman to regain mobility in her upper limbs. 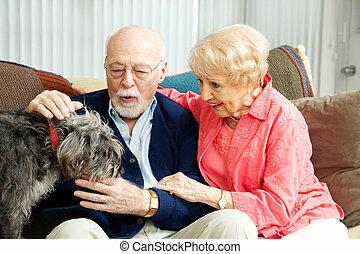 Senior couple at home on the couch, playing with their adorable mixed breed dog. 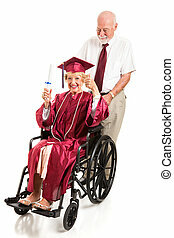 Disabled senior lady graduate gives a thumbs up as her husband pushes the wheelchair. Full body isolated on white. 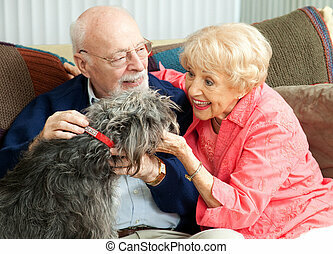 Senior couple at home with their adorable scruffy little dog. 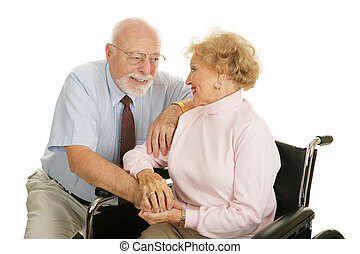 Loving senior couple coping with the wife\\\'s disability. Isolated on white. 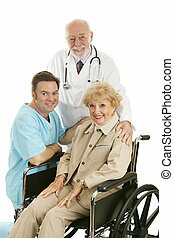 Senior lady in wheelchair with her doctor and nurse. Isolated on white. 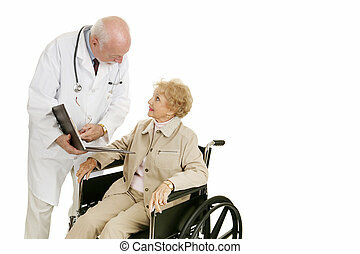 Disabled senior woman consults with her doctor. Isolated with room for text. 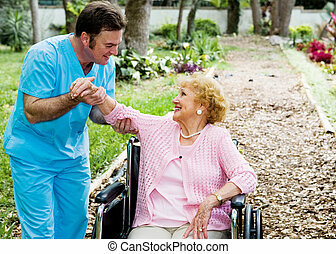 Senior woman with her doctor. 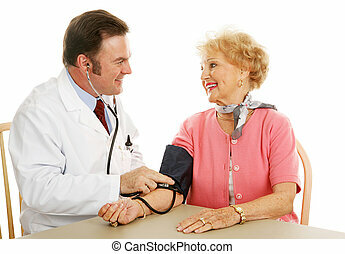 They are happy her blood pressure is normal. 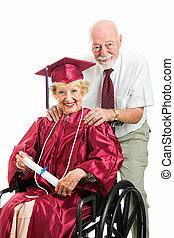 Senior woman in wheelchair graduates with the help of her supportive husband. Isolated on white. 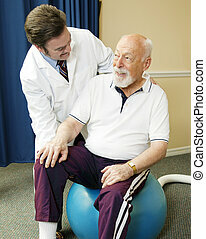 Senior man with arthritis is not enjoying his physical therapy session. 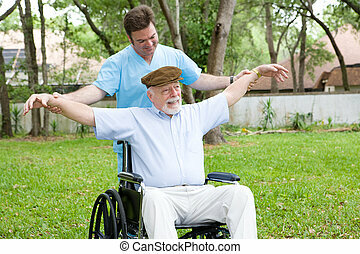 Physical therapist working with a senior man outdoors in the fresh air. 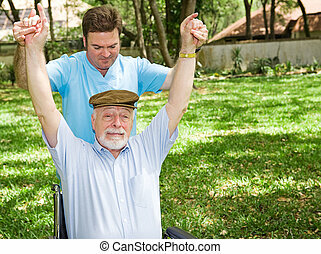 Senior man and his physical therapist having a pleasant outdoor workout. 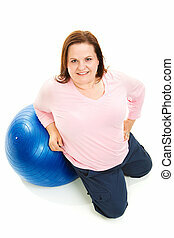 Full body isolated view of a pretty, overweight woman with a pilates ball. Pretty woman in her early sixties doing yoga on a white background. 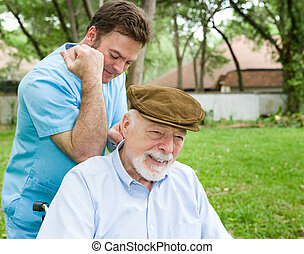 Massage therapist massaging a senior man\\\'s back in a beautiful outdoor setting. 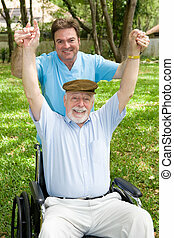 Disabled senior man does stretching exercise with the help of his physical therapist. Beautiful blond senior woman does yoga for exercise. Isolated on white. 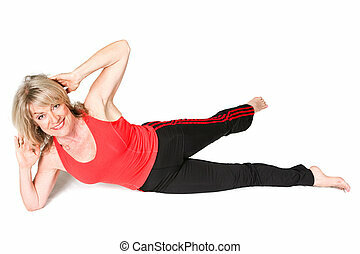 Fit woman in her early sixties doing a challenging pilates pose with ease. Isolated on white. 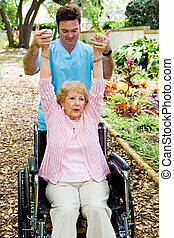 Beautiful woman in her early sixties doing stretching exercises to help her back pain. Isolated on white. 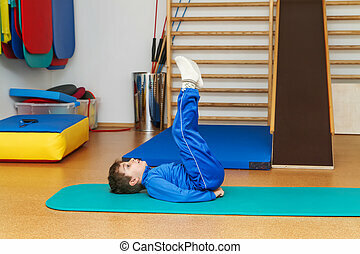 Very fit woman in her early sixties doing pilates. Isolated on white. 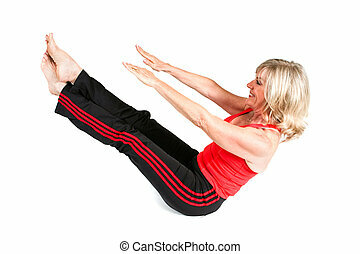 Beautiful senior woman over sixty doing a difficult pilates pose. Isolated on white. 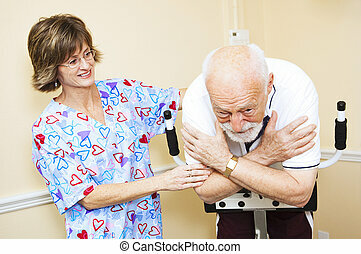 Chiropractic doctor helps elderly patient with her physical therapy. 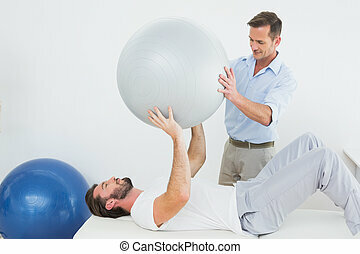 Physical therapist using pilates ball to work with senior chiropractic patient. 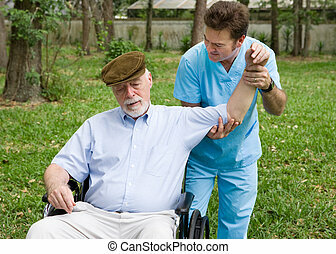 Chiropractor helping senior patient with physical therapy routine. 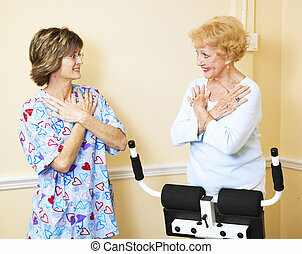 Senior woman exercises with the help of a physical therapist. 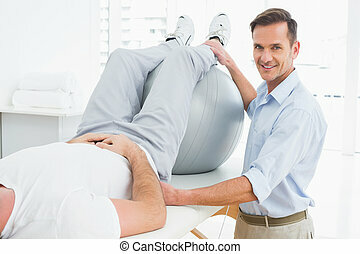 Chiropractor does physical therapy with a senior man, using a pilates ball. 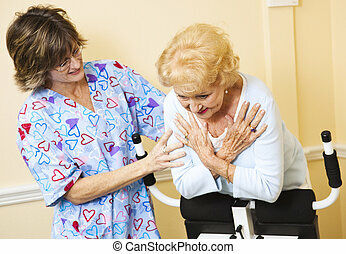 Senior woman doing physical therapy on her back with the help of a chiropractor. 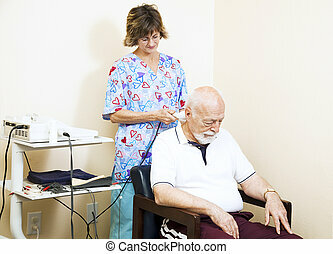 Physical therapist in chiropractic office gives ultrasound therapy to a senior man with neck pain. 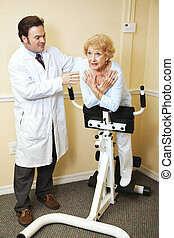 Senior woman at chiropractors office, working with a physical therapist to learn exercises for her back problems. 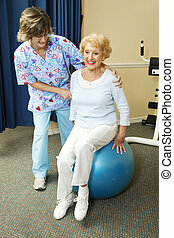 Physical therapist helps a senior woman exercise on a pilates ball. 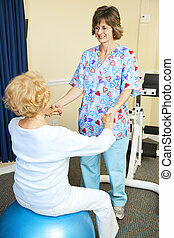 Physical therapist working with a chiropractic patient to improve her spine flexibility. 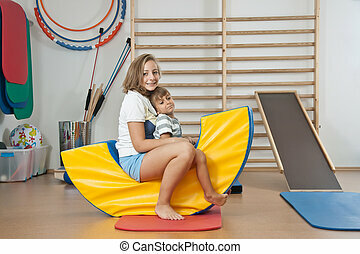 Senior woman with back problems uses a Roman Chair to exercise her back, while her chiropractor helps. Senior woman using chiropractic Roman Chair to stretch her spine, with the help of a nurse. 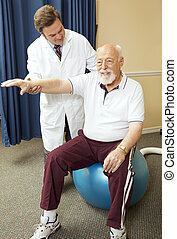 Physical therapist at the chiropractors office helping a senior man stretch his spine on a Roman Chair exerciser. Authentic and accurate content depiction. 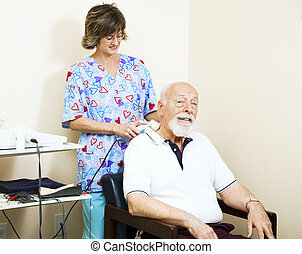 Chiropractic nurse treats a patient's neck with ultrasound therapy. 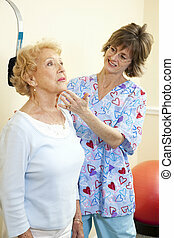 Senior woman exercising her neck with help from chiropractic physical therapist.